There is no doubt that if you are in the business of growing weed, you want to make sure that the yields are also good. No one wants to invest in something with low returns. Nevertheless, it is a process when it comes to getting the most of the yields. This is because we get to check out some tips on maximizing on the yields generally. Well, you will not be getting the best yields if the strains are also inferior. It is the reason why you have to look for high yielders in the first place. With many shops offering marijuana seeds, it is possible to pick up the best yielder. They are likely to be expensive seeds, but the high yields should be worth every penny. You can always compare several Sensi Seeds options to find one that works great for you. From the comparison, you can always have one that emerges as the best to use on overall. This is another thing you have to keep in mind. It is always crucial that you provide the right conditions to ensure that you can have some good yields on overall. Having the incorrect levels of airflow, temperature, and even humidity can lead to some serious downside to the yield. Look for any signs that show that the plants do not have the right conditions provided. It is from there that you can make adjustments to ensure that the plant does end up with some good yields generally. For a beginner, sometimes you might make mistakes to end up with a low yield. It is good to go through various research materials to understand what are the best options for you to get to optimize the grow room conditions. The light intensity is definitely important for the growth and flowering of the marijuana plants. It is therefore important to deliver on the right light intensity if you are going to have the best produce all along. We all know that light helps with the photosynthesis process. If the light intensity is not good, then you cannot have the best yielding plants. You also have to check out the light needs based on the plant stage. It will reach a point where you have to increase the light intensity or reduce it altogether. Another thing you have to keep in mind should be the bulbs. In most cases, you might have to use the 600W or the 1000W bulbs. 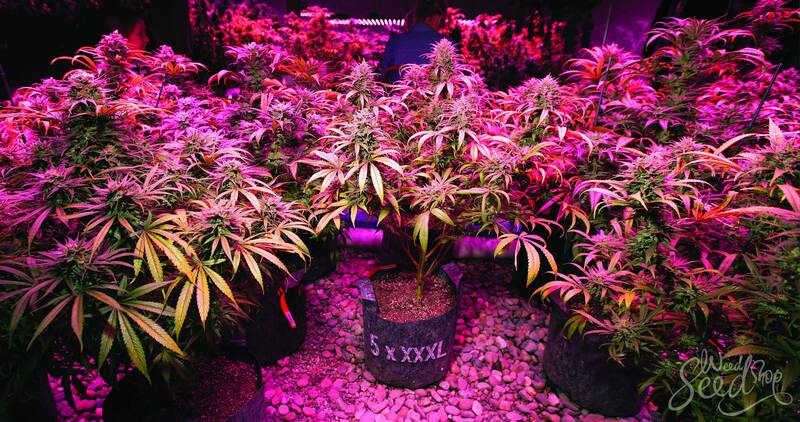 Depending on the size of the grow room, sometimes you get that it is possible to use more bulbs to cover it wholly. More light always means that the plants are exposed directly to the light to ensure better growth. Remember that some bulbs are even likely to increase the heat in the room. So, make sure that there is also a good cooling system. This will help to ensure that you get to set the right conditions in the grow room always. Another option you have it to use CO2 gas as a way of improving the yields. A substantial research does show that you will always have more yield when it comes to introducing CO2 to the grow room. As much as that is the case, you do not just end up pumping a lot of CO2 into the grow room. It is recommended that you only use a level of 1500 PPM. Anything higher than may start being detrimental rather than improving the yields of a product. Another good solution to having more yields is through pruning. Sometimes improving on light coverage and penetration is the answer to having more yields from your grow room. You can now selectively prune the plants and train them so that they are exposed to the light even better. If you want to make sure your plant is not going to transform into a male, the quality of your Cannabis Seeds is also important. You still have to consider the placement of the lights so that your light can reach the plants effectively. In the end, you will always love the way the marijuana plants are growing so as to have a great time enjoying the high yields in the end.